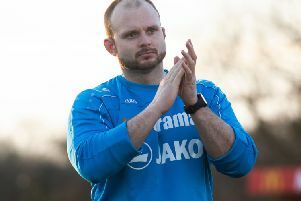 Tudors Boss Dean Brennan says he is already looking to build for next season – regardless of what happens between now and the end of the current campaign. Going into this weekend’s Conference South double-header with Maidenhead United on Saturday and Concord Rangers on Monday, Hemel still have a chance of reaching the Conference South playoffs. Realistically the Tudors will need to win each of their remaining five league games if they are to sneak into the top five, but Brennan says that the club will need to invest next season whether they get promoted or not. “We will see where the club wants to go and what it wants to do. Hopefully we can get the backing to bring the success,” said the Hemel boss. Whatever the outcome, Hemel have enjoyed a hugely encouraging debut campaign in the Conference South, and Brennan is looking for more of the same in the future. This is a massive town and it needs a team to cheer on and be successful. “I’ve got two years left on my contract and I try to make everything into a positive,” he said. “It’s the only way I can do it. “I like to have positive people around me and the fans have been outstanding. We brought easily over 200 people to Boreham Wood last weekend and they were right behind us, even though we played so poorly. “It just shows how far the football club has come – I remember my first game at home to Chippenham when the attendance was only just over 200, yet we’ve just taken more than 200 across to Boreham Wood in the Conference South. “We’ve come a long way, and myself and (assistant manager) Stuart Maynard love it at the football club. “We see the potential in the football club – this is a massive town and it needs a team to cheer on and be successful. I can only see the club growing. “We’ve just got to make sure we get things right within the football structure of the club. “We’ve got to get the pitch sorted, that’s essential, and we have to get our finance structure in place, but I always say that we will never spend what the club can’t afford. “We understand that there is a business model and we have got to get that right for this level. We all know how quickly things can change. “You look at teams like Staines, who finished eighth last year but have now been relegated. The teams who kick on are the ones like Concord and Gosport who have had a bit of investment.